Last May 30, 2017 is this year’s fifth day of the fifth lunar month of the Chinese calendar. During this day when the traditional Chinese festival called the Dragon Boat Festival is celebrated. To get a feel of the festival, St. Stamford Modern Cancer Hospital Guangzhou organized a get-together event for patients and their families from Indonesia, Malaysia, Philippines, Thailand and other Southeast Asian countries to join in the two key tradition activities -- eating rice dumplings and watching dragon-boat racing. Each cancer patient in St. Stamford Modern Cancer Hospital Guangzhou received rice dumplings specially prepared by the medical staff. It was the first time for Amy (alias), a cervical cancer patient from Australia, to see Chinese rice dumplings. “Wish all of you a happy Dragon Boat Festival!” said Amy in Chinese which she just learned. Mr. Chan is a liver cancer patient from Vietnam，“We celebrate Dragon Boat Festival in Vietnam, too, but we don’t have rice dumplings. I will take these rice dumplings home to share with my families. ”, said happily as he bids farewell for his discharge. To witness the exciting adventure, cancer patients were brought to Shipai Village of Tianhe District, to watch the traditional activity of Dragon Boat Festival --- Dragon Boat Race. 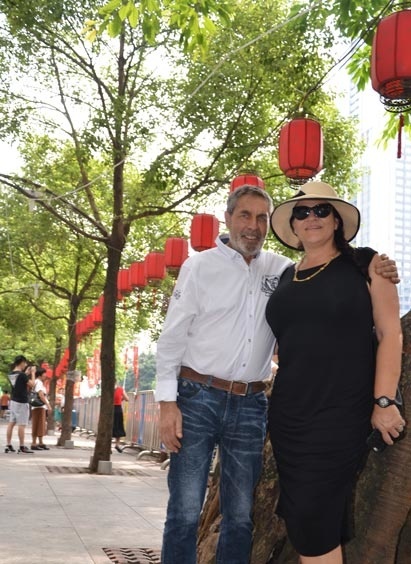 “I have never seen such exciting dragon boat race before, it is authentically Chinese. I like it very much seeing the dragon boats intensely competing each other” Bohr, a Dutch colorectal cancer patient said excitedly. Bohr and his wife were thrilled as they experience themselves in the traditional Chinese culture. As a JCI cancer hospital, St. Stamford Modern Cancer Hospital Guangzhou adheres to the principle of “patient-oriented” and has devoted in providing foreign cancer patients the advanced medical technologies and the highest quality medical services. It is the pride and joy of the St. Stamford Modern Cancer Hospital Guangzhou holding different activities for patients to help create a comfortable, warm and friendly environment for foreign cancer patients, giving them a different healthy perspective of the facility as they go on their battle of the disease.